The HBO drama heads for a potentially explosive second season finale Sunday amid a robot rebellion and new questions about the meaning of humanity. 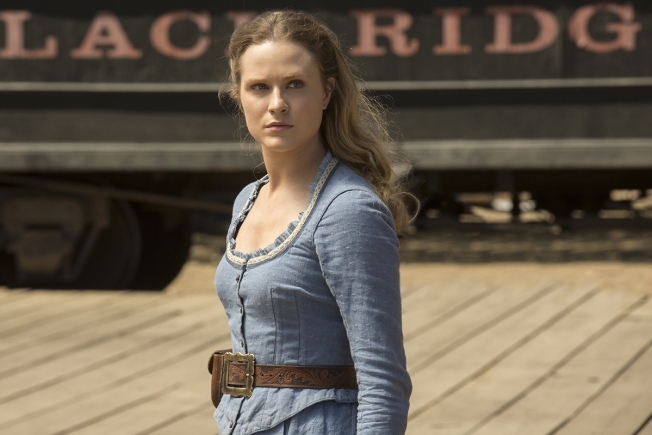 Evan Rachel Wood of "Westworld"
During the most recent episode of "Westworld," AI theme park co-creator Robert Ford warns there's "one final game" to come following a confrontation with theme park head and obsessive visitor William, aka the Man in Black. It's not clear whether William heard the ominous words, spoken after a fancy dinner in his honor. It's also not clear exactly when this happened. As with "Lost," it's easy to lose yourself in an increasingly complex story playing out over different locations, timelines and realities. But the action driving "Westworld," which heads for an explosive second season finale Sunday amid a robot rebellion, is less a game than a series of linked, high-stakes multilevel quests. The androids search for humanity while guests surrender theirs for illicit fun – and, unwittingly, for others’ pursuit of money and immortality. The first season of the HBO drama tackled what it means to be alive, through the synthetic eyes of the “hosts” that inhabit the Wild West playground. The second season upped the ante, revealing (spoiler alert) that Westworld essentially downloads customers' minds to make better robots, and, potentially, longer-lasting humans. The humans and robots are becoming closer, tied by shared journeys to unlock the mysteries of “The Maze” and ”The Door,” which gave the first two seasons their titles. People and machines also are bound by somewhat parallel torments that stretch from the native American androids of the Ghost Nation to the Japanese warriors of Shogun World. In the latest episode, the Man in Black killed his adult daughter, falsely believing she was a robot Ford sent to do him in. Meanwhile, Maeve, the salon madam robot Ford likened to a daughter, is on an unrelenting mission save her own little girl. The Man in Black put a gun to his head after realizing his tragic error, but couldn't pull the trigger. He’s apparently losing his mind, and, last we saw, doubting his very humanity. Yet Teddy, the once-kind AI cowboy turned into a killing machine when reprogrammed by robot rebellion leader Dolores, is unable to live with increasingly inhuman self. "You changed me, made me into a monster,” he tells Dolores before shooting himself. Dolores’ determination to save her beloved father, malfunctioning under the stress of years of heartache and conflicting memories, echo decades of glitches in efforts to make William’s father-in-law, park owner, James Delos, immortal by downloading the data of his mind into a new body. Ford, who had his robots kill him in the Season 1 finale, achieves if not immortality, then a godlike omnipresence through his creations. This includes, Bernard, the android rendering of Ford’s late partner, Arnold, and perhaps the most human of the robots. “What's the end of your story?” Bernard asked Ford in Episode 7. “Isn't the pleasure of a story discovering the ending yourself, Bernard?” Ford replied. What may be the line of the season was delivered by Anthony Hopkins, part of a brilliant cast that includes Thandie Newton (Maeve), Evan Rachel Wood (Dolores), Ed Harris (the Man in Black), Jeffrey Wright (Bernard) and James Marsden (who delivered a master class in subtly as Teddy this season). Show creators Lisa Joy and Jonathan Nolan fill “Westworld” less with pleasure than with intriguing and vexing twists and detours. But they’re making a strong case for hanging on for Sunday’s season finale and beyond. The game, despite what Ford says, appears far from over.